This radio does not have general coverage receive. There is a built-in speaker. I bought this rig as a project rig in junk condition in 1991. It had fallen into the hands of a hacker who had converted it to 11m and damaged parts all through the rig...cracked slugs, damaged PC boards, etc. Cosmetically it was good, so I bought as service manual and set out to bring it back to life. After a couple of months of work in my spare time, it was back on the air. I was very impressed with the receive audio quality, rx sensitivity for it's day, stability after a short warm-up, and just the overall handling and feel of this rig. 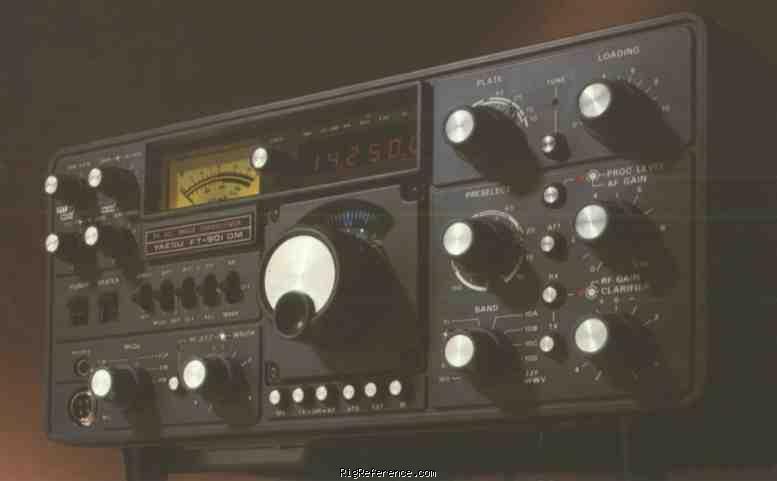 It was Yaesu's contest rig of the late 70's, and had features like: Adjustable Audio Passband Tuning, built-in keyer, VOX, Auto Mic Gain Control, adjustable notch filter, adjustable I.F. width, tx processor, etc. It still has a prominent location in my primary operating position, and is used nearly every day. Estimating the value of a rig can be challenging. We collect prices paid by real hams over the years to help you estimate the current value of the Yaesu FT-901DM. Just bought or sold this model? Let us know what you traded it for and help other ham operators!